Say there, are you itching for the chance to pull a trigger on a Tesla Model X so you can savor the envious looks you'll get from your Silicon Valley millionaire neighbors? The good news is when you do, it won't cost much more than a Model S, according to Elon Musk himself. 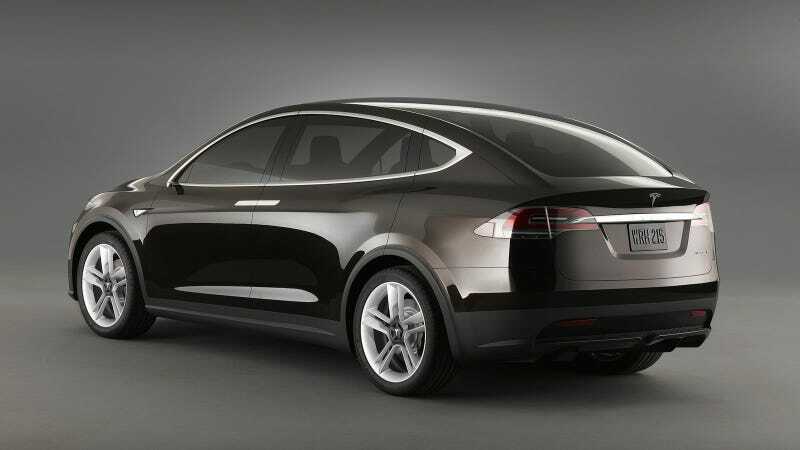 The Model X's price will be very similar to the Model S. It might be slightly higher, but... I can't imagine that it will be... It's probably going to be a slightly higher starting price because the Model X will only be offered as all-wheel drive. It will be dual motor, all-wheel drive. The stuff about the Model X starts at about the 24:00 mark. Yes, I know it was recorded with a potato. Whoever has this camera can't upgrade because he's saving up for a Model X, probably. The all-wheel drive stuff is an interesting bit of news, especially because Tesla's own website says the Model X will have optional all-wheel drive, with the standard version being rear-wheel drive like the Model S. Perhaps Musk was talking about the UK version? Anyway, in terms of pricing, if it's similar to the Model S we can expect it to be anywhere from about $60,000 to more than $100,000 depending on options and the type of battery used, not including federal tax credits. Whether the Model X comes with those amazing gullwing doors or not, I predict it will be a massive sales success. If there's anything Americans love more than a luxury sedan these days, it's a luxury SUV. This thing is going to make it rain cash on Elon so hard he'll think he's hanging out in the club with Rick Ross. Look around, Model X-es for the whole team!